. RPS Collective's popular art and crafts classes are open to the public, and over 50% of classes are either free or donation-based. The RPS Collective started using Google Docs over two years ago to streamline their processes, and--true to their mission--to promote collaboration. Mark echoed the challenges faced by many non-profit organizations, "We have lots of meetings, but being volunteer-run, having lots of meetings is just really tough. We realized that we should be collaborating more online. And Google Docs is a really good way for us to do this." Today, Mark and his teammates use Google Docs to write grant proposals collaboratively, circulate how-to guides, and manage volunteers' schedules. Volunteers help with everything from operating the retail store, staffing gallery events, to teaching classes. For more information on volunteering at the RPS Collective, visit their website at www.rpscollective.com. What do girl-friendly skateboarding, making shoes out of a sweatshirt, and building a website have in common? 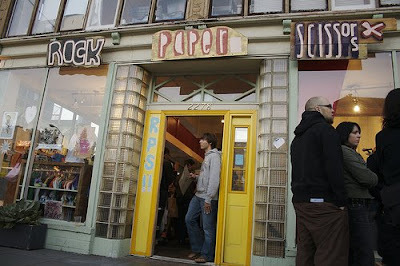 They're all examples of classes that are offered by the Rock Paper Scissors Collective -- a volunteer-run organization based in Oakland, California dedicated to promoting creativity and collaboration in the community. Continuing our series on non-profits, we chatted with Mark Nicola, Volunteer Coordinator, about the organization and the work (and art) that they do for their local area. Now in its fourth year of operation, the RPS Collective achieves their mission by providing classes, youth outreach programs, an art studio, a retail store, and exhibition space for the community to come together through art, crafts, and performance. High school students can take advantage of an internship program to explore their interest in art, fashion and entrepreneurship, while artists can apply to have their work displayed in the gallery or sold in the Collective's store. RPS Collective's popular art and crafts classes are open to the public, and over 50% of classes are either free or donation-based.